Over the past few years, I’ve been writing about Rouvy a couple of times to keep you informed about how they were becoming a serious contender in the online training platform market. I started using Rouvy in the winter of 2014 – 2015 I think. At the time, it was still ‘under construction’ and the quality of their video footage was no match for Tacx TTS, so I didn’t spend a lot of time in their virtual realm. In the beginning, I wasn’t really aware or serious about the ‘career mode’ they offered either, but when I eventually started participating in their challenges, I also started to work on my career and I reached Legend status somewhere during the 2016 season. Skip straight to the tips? Click here. Much to the surprise of its members, Rouvy did a career reset on October 1. Not the date was – or should have been – a surprise, but the fact that this year they reset everyone to ‘starter’ level, was a big – and nasty – surprise to many. Last year, only Legends could request a reset to starter, but all others would be reset to the beginning of their current level. While I do not mind either way, it would have been a lot better had Rouvy informed its members timely / properly. As usual, they have come up with an explanation after the fact – you can read more about it here. Earlier this month, I reached Legend status again, which makes me ‘Rouvy Double Legend’ and should bring me ‘intergalactic respect’ *. I’ve written about the new Rouvy career concept a few posts back and when they published the new schedule for upcoming challenges, I anticipated finishing my 2017 – 2018 career early June. 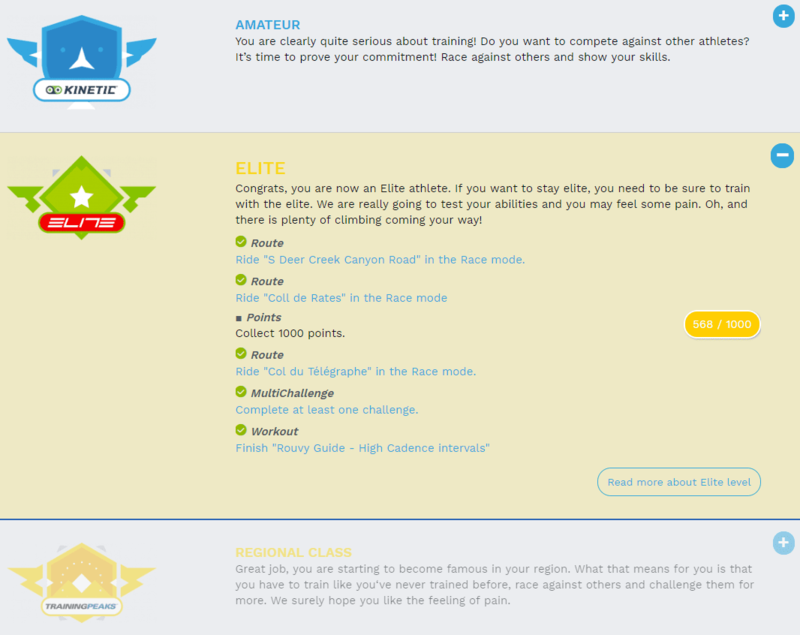 I accumulated a lot of TSS points and even finished a challenge I thought I wouldn’t be able to during my holiday – after that and 4 other completed challenges by mid-May, the wait was for the final required challenge, which was the 100K PowerTap Endurance challenge starting on June 4th. Earlier this year, while at the LBS for some preparations on my Sensa Trentino, I was going through the latest brochure of Sensa Bikes. As you (probably / should) know, I have modified my Giulia G2 to look like a TT bike, by replacing the standard handlebar and aero bar clip on with a 3T Vola cockpit. However, I quickly found out that this meant I couldn’t (comfortably) ride any serious mountain stages, so I got the Trentino. And as it also didn’t quite fit the profile of a true TT bike, the pages in the brochure with Sensa’s TT and Tri bikes, caught my eye. 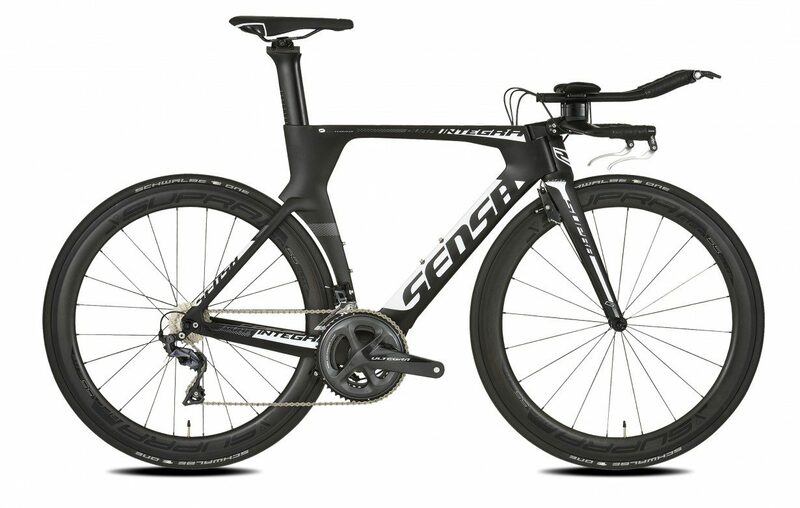 Sensa offers two bikes in that segment: the Dura Integra and the Dura Triathlon. While I figure(d) the triathlon bike will offer a slightly more comfortable geometry and position because of the length of the courses you will ride with that, I didn’t quite like the look of it. Not that it would matter much, because surely there was no way in hell the boss would allow the purchase – or even trade in – of my just over a year old Giulia, right? I became a Rouvy Legend somewhere last year, meaning I completed all the tasks of the career path. Which would have meant that I could finally retire and die in peace, if it wouldn’t have been for a drastic change in the career concept. You can read about that – and the addition of branded challenges – here and here. You can read my ‘Legend interview’ with them here. After my ‘Tour de France 2017‘, I had a few spins in and just outside my backyard, but by October 1st, I was ready to start the indoor season. My main app for training is obviously Rouvy which has been my favorite for the past two and a half years or so (see my original post on indoor apps from February 16, 2016). As I own a vast collection of films with footage from just about every major EU/US climb, scenic ride and Ironman track, I have enough to watch while training, other than what Rouvy itself offers. And sometimes I use ‘free ride’ mode for a recovery spin, in which case I put on one of these films too.